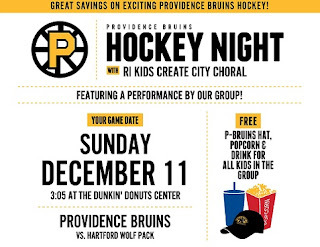 The RI Kids Create Community Choir will sing once again this year at the Providence Bruins game on December 11, 2016 at 3:05 pm. We are seeking more members. This would be a great opportunity to show off your talent. Rehearsals will be held at Avery Piano on Wednesdays at 4:00 pm. If you would like to enroll your child, please send me a note on the contact form to the right. Members must be age 10-21. Any child who sings will receive a free t-shirt, free hat, free drink, and free popcorn. Spaces are filling up! Contact me today to reserve your space. Sign up here.